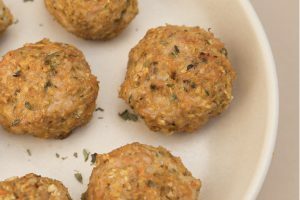 Because we are always looking for ways to pack extra nutrients into our little one’s diet (and our own, to be honest), we’ve created a Turkey & Apple Meatball recipe that has everything you want in a meatball and more. 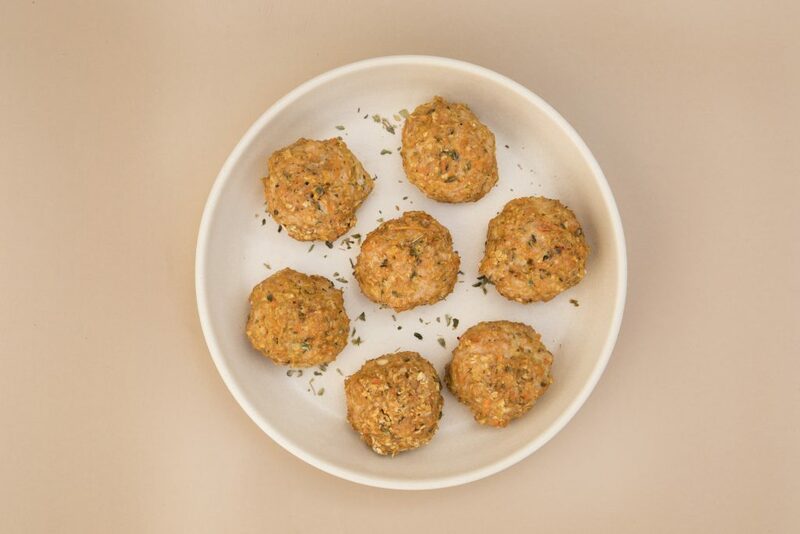 To make things even better, the prep time for this meatball recipe is under 15 minutes– so you can have more time doing what really matters– spending time with your family. In addition to turkey, the star ingredient of these meatballs are apples. Apples add a punch of vitamin C and fiber, and a subtle sweetness. Carrots add a nice dose of beta-carotene and loads of other vitamins and minerals. Oats bring some extra fiber to the table, and improve the texture of these scrumptious meatballs by soaking up the extra moisture from the apples and carrots. These are truly delicious– and they’re something you can feel good about serving to your little one, and to yourself. Secretly packed with nutrients & not-so-secretly delicious. Preheat oven to 400F degrees. Prepare a baking sheet by lining it with parchment paper. In a food processor, combine oats, chopped apple, shredded carrots, diced onion, oregano, garlic, salt, paprika, black pepper and chili powder. Pulse the food processor until the ingredients are chopped finely and well-combined. Remove the mixture from the food processor and add into a large mixing bowl. Using a large spoon, mix in raw ground turkey and combine well with the oat, apple and carrot mixture. Using a spoon, scoop a golf-ball sized amount and form into a ball. Place the meatballs on the parchment-lined baking sheet. Bake for 14-16 minutes, until the meatballs are cooked all the way through, and the the outsides of the meatballs are golden brown.